13 brand new projects to teach embroidery skills and sell machines! New for 2018! Volume 2 includes 13 exceptional designs, complete Program CD, Instructions, Power Point Presentations for Teachers, Digital Marketing Materials, and Shop Guide, plus Tabletop Display Stand. Dealer Exclusives projects are not available for separate sale. Customers only receive the designs by visiting your shop. Wondering what to teach at embroidery club? Would you like to highlight fun embroidery products in your shop? Do you need a project for new machine owners? Kimberbell Dealer Exclusives is the answer! 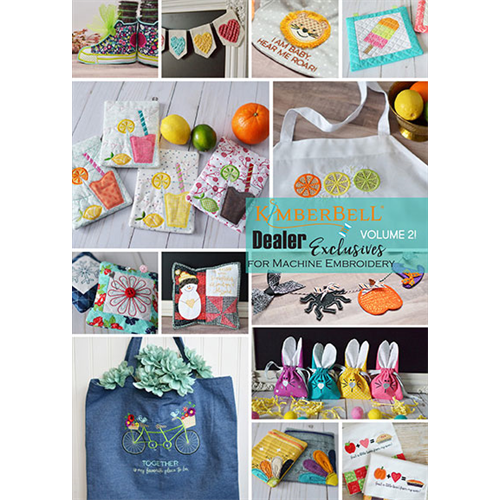 Kimberbell Designs allows only dealers who purchase the Dealer Exclusives for Machine Embroidery Program to print and/or copy paper instructions and limits electronic file transfer directly from you, the dealer, to participating customers by USB only. This should be an in-person visit to your store to receive transferred files. Kimberbell Dealer Exclusives are not retail products and are not intended to be sold directly to customers. Designs should not be sent or distributed by mail, email, over the internet, or download from your business website. The designs may not be placed on a CD and offered as a collection. Projects are designed for classroom or in shop club gatherings. You may require enrollment for club membership, charge a class fee where the project will be taught, or sell kits to make the project, but you may not charge for the file. The maximum number of customers who participate in the Kimberbell Dealer Exclusives Program through your shop is determined by you, the dealer, and not restricted by Kimberbell Designs. Projects must be used within the context of the Kimberbell Dealer Exclusives program. Customers should also respect this copyright by not sharing the files with others.